Zimbabwe is a landlocked country in southern Africa known for its dramatic landscape and diverse wildlife, much of it within parks, reserves and safari areas. Here are 12 Reasons to Visit Zimbabwe. Hwange National Park is the largest game reserve in Zimbabwe. The park lies in the west, on the main road between Bulawayo and the widely noted Victoria Falls and near to Dete. The Matobo National Park forms the core of the Matobo or Matopos Hills, an area of granite kopjes and wooded valleys commencing some 35 kilometres south of Bulawayo. Open to visitors throughout the year, the Victoria Falls National Park in north-western Zimbabwe protects the south and east bank of the Zambezi River in the area of the world-famous Victoria Falls. 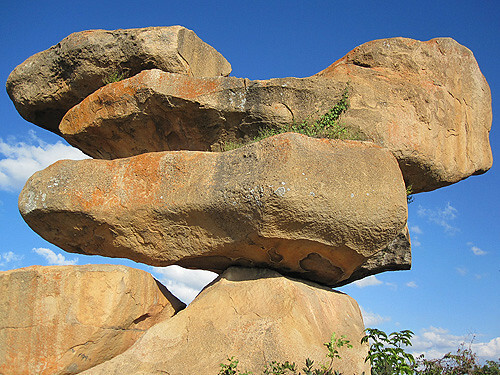 The Balancing Rocks are geomorphological features of igneous rocks found in many parts of Zimbabwe, and are particularly noteworthy in Matopos National Park and near the township of Epworth to the southeast of Harare. Nyanga National Park lies in the north of Zimbabwe's Eastern Highlands. One of the first national parks to be declared in the country, it contains the highest land in Zimbabwe, with green hills and perennial rivers. Chimanimani District is a mountainous area in the province of Manicaland, eastern Zimbabwe. The Chapungu Sculpture Park is a sculpture park in Msasa, Harare, which displays the work of Zimbabwean stone sculptors. It was founded in 1970 by Roy Guthrie, who was instrumental in promoting the work of its sculptors worldwide. The National Gallery of Zimbabwe is a gallery in Harare, dedicated to the presentation and conservation of Zimbabwe's contemporary art and visual heritage. National Heroes Acre or simply Heroes Acre is a burial ground and national monument in Harare. The 57-acre site is situated on a ridge seven kilometres from Harare, towards Norton. The Zimbabwe Museum of Human Sciences, formerly the Queen Victoria Museum is a museum in Harare. The museum contains the seven-hundred-year-old Lemba artifact ngoma lungundu, which some believe to be an replica of the Ark of the Covenant.